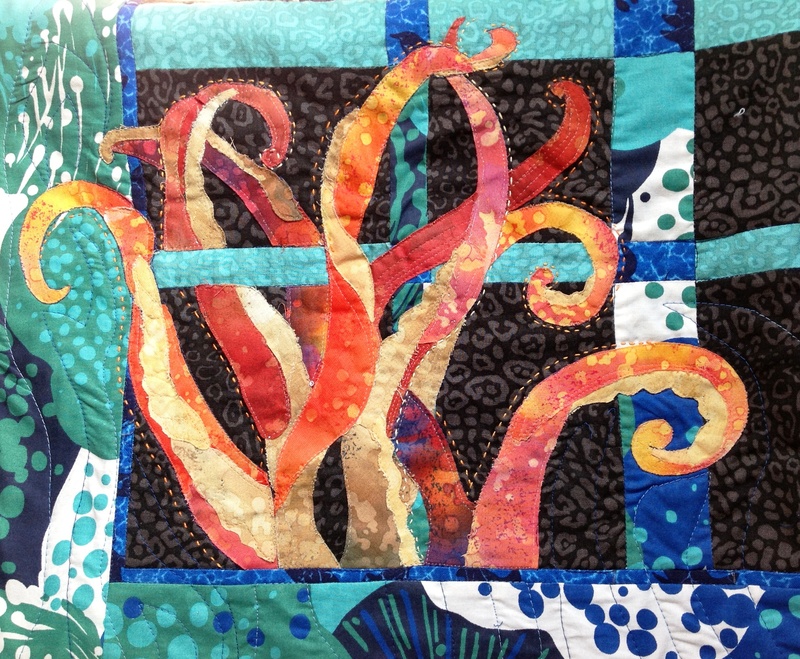 In an Octopus’s Garden…in the shade! 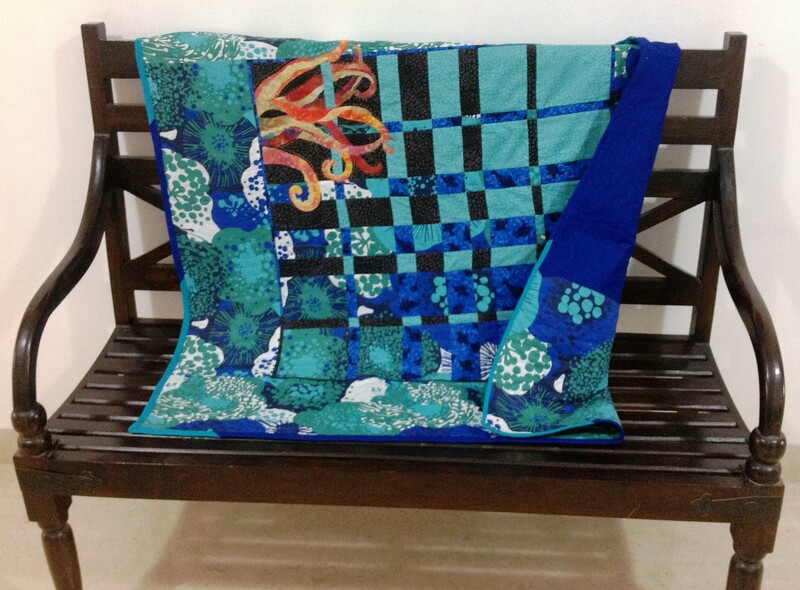 I made this quilt for a challenge with my quilting group Desi Quilters, for which one had to make a quilt using strips. I had always wanted to make a Convergence Quilt and I had the perfect print for it! 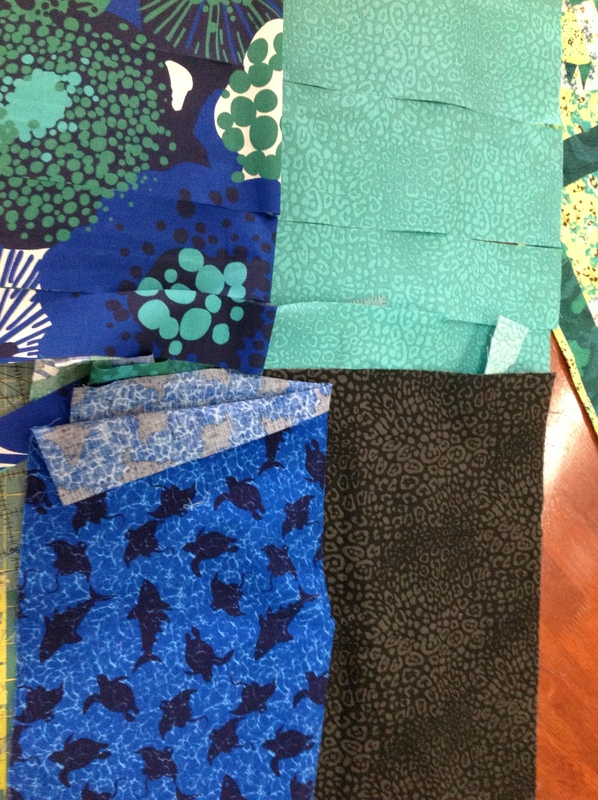 4 fat quarters of nicely contrasting fabric. It works best when the main fabric is a large diffused (all over ) print or batik with strongly contrasting colours. 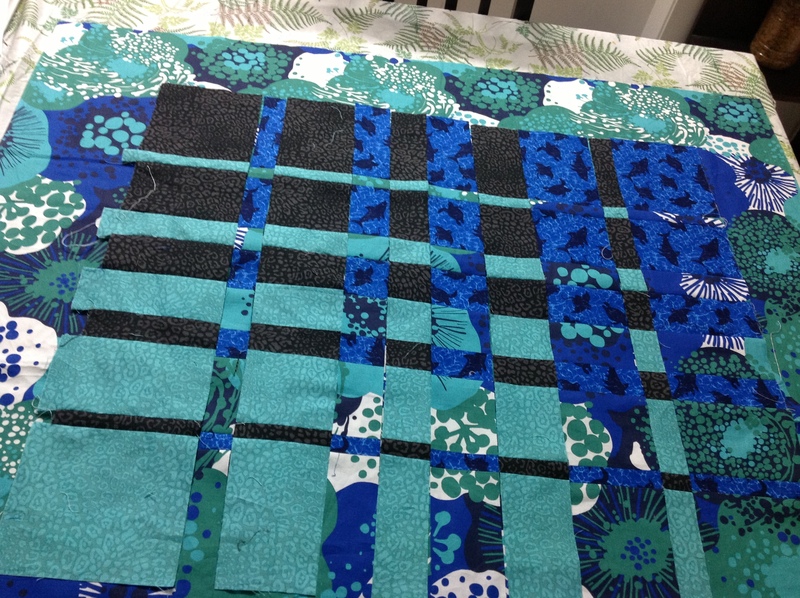 And here is the how the top would look once finished… I added a 1/4″ inner border to frame the strips, before adding a wide 7.5″ border (cut at 8″) on the outside. I quite love it! 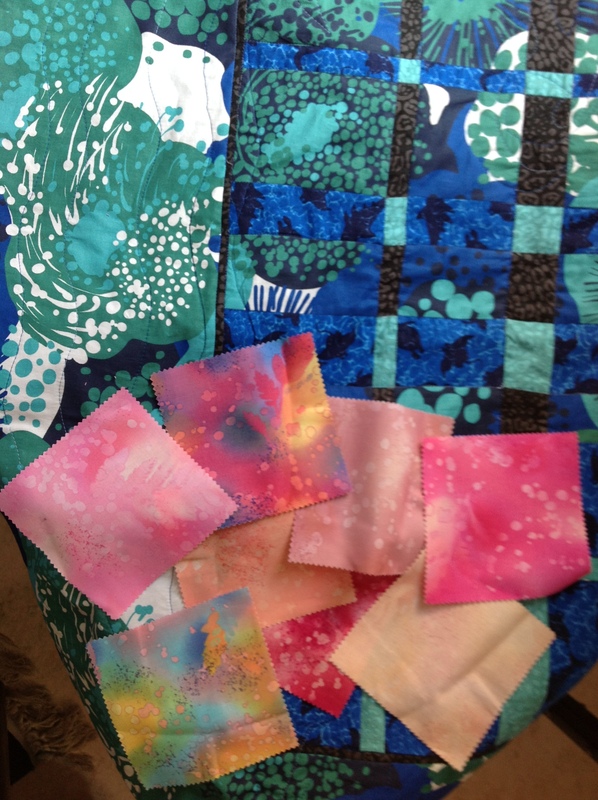 As I was sewing it, a song kept playing in my head – no points for guessing which! 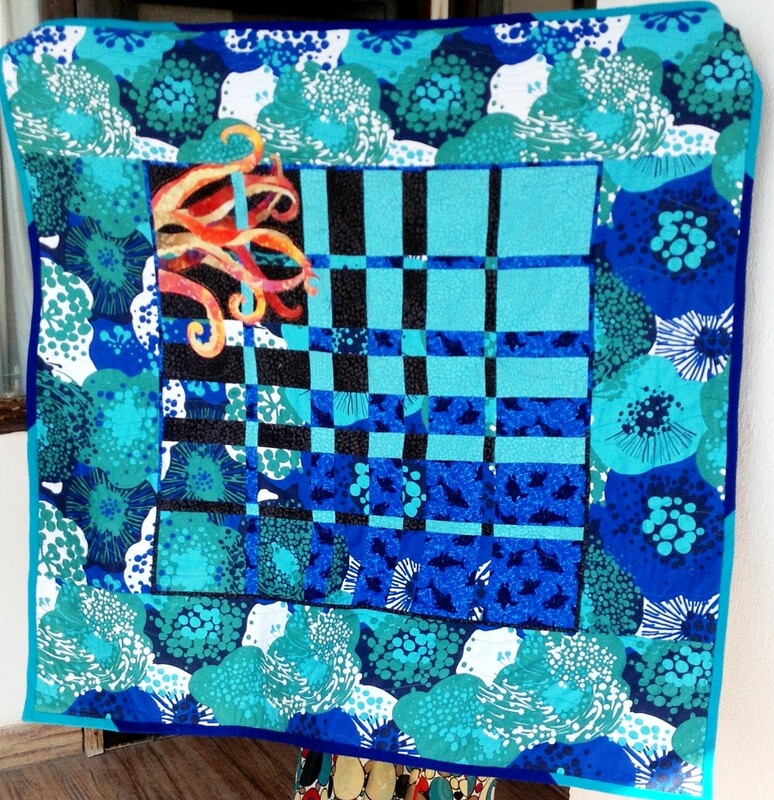 Debra Harry’s Octopus Quilt and a quilt on The Calico Cat’s blogspot. I decided to base my Octopus on Debra Harry’s Octopus. For the fabric I turned to a Fossil Fern charms pack gifted to me by a wonderful friend Chumkie, from my Desi Quilters group. I needed a range of shades in the same colour. Brighter for the tentacles in the foreground, and darker in the tentacles to the back. Also, the underside of the tentacles had to be a much lighter shade. It was like painting with fabric! 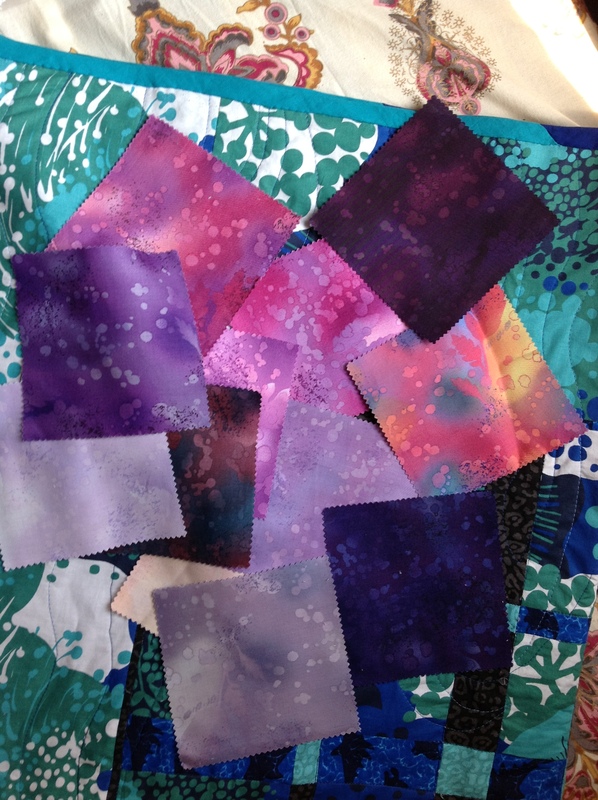 ( A good idea is to lay out your fabrics together and take a picture. You get a much better idea of what ‘clicks’ and what does not! 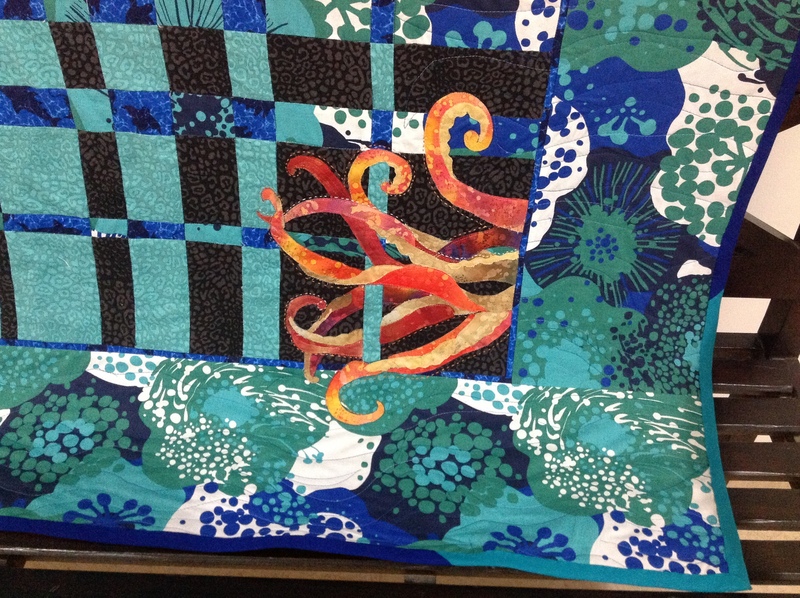 Once the decision for the fabric was made, I sketched the Octopus on newspaper and cut it out, placed it on the quilt to see how it looked. Too small! So I sketched a bigger one and that seemed just right. Sorry, I did not take pics of this stage either. 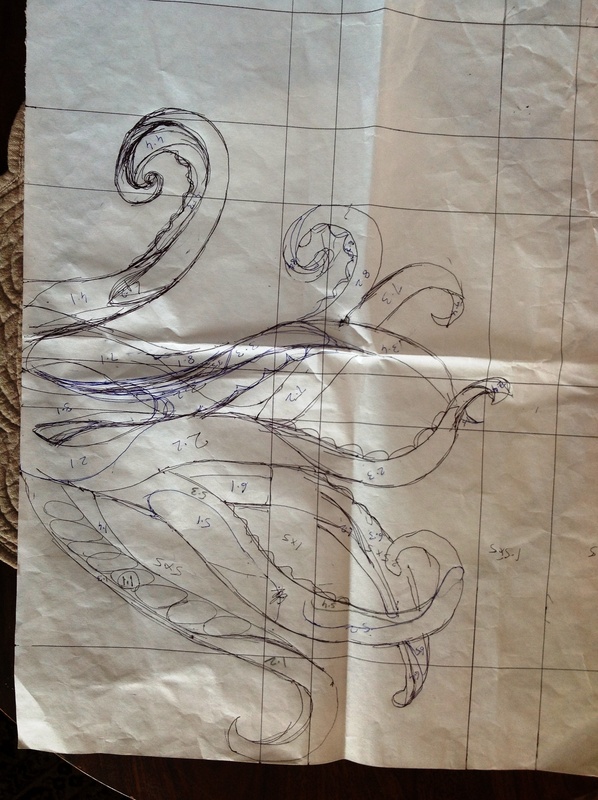 I the sketched my Octopus on the grid, freehand, as you can see! Each small piece was then traced on to Heat n Bond Lite (pink), leaving an extra 1/6″ on the edge that was to be overlapped by another piece. 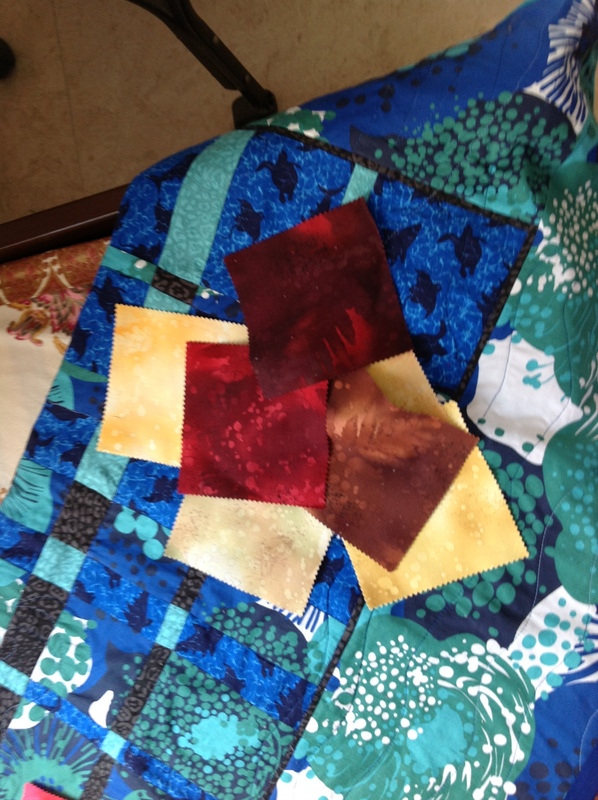 All the pieces were laid on the fabric top, the paper removed one by one, and the fabric was ironed on to the quilt top. Learning: Here I realised that I should have handled it one tentacle at a time. Ironed one (the lowermost), stitched it, then the next… because by the time I was through with ironing it, edges had started to come off! The very small pieces even came off as I was stitching. That is why a few of the tentacles are wonky! I suppose I should overstitch the edges with satin stitch, now that I own a Brother, but I think I like the raw edged look:-) Or maybe, I am just too lazy. 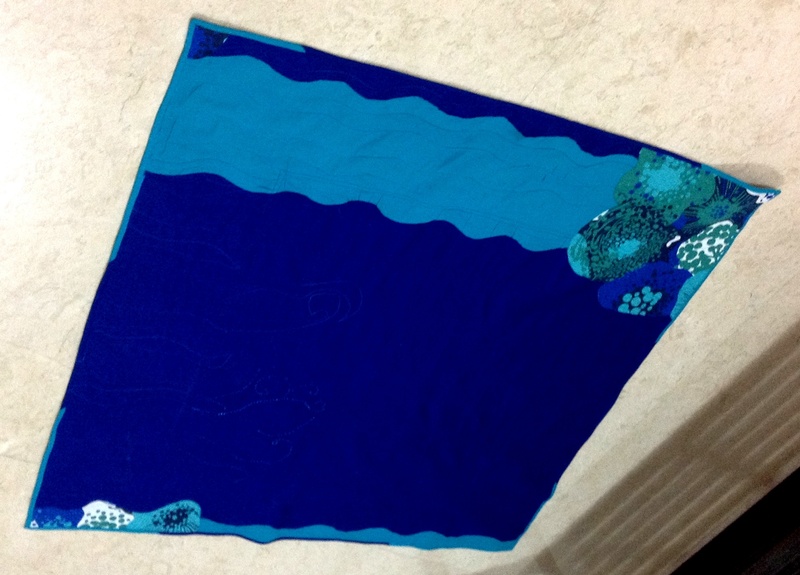 I used an old shawl as the batting and quilted it with waves. For the binding I joined the two solid backing fabrics and cut them diagonally to obtain a bias binding. Originally I machine stitched the binding ( from the back to the front!) because I was in a hurry. I thought it was quite hideous, and ripped, folding down the edges with invisible hemming. An Octopus’s Garden with me! Of course, my Octopus has been christened Paul,after my favourite Beatle!